By Norman Solomon / Truthdig. I’ve written many hundreds of columns. The one below has caused me the most uncertainty about going public with it. I’m accustomed to writing about facts, quotes, documented history, while offering assessments. But this piece extrapolates from the current zeitgeist, going into realms of events that must be speculative and—until too late—unprovable. So lucky to be here. Tiny island of dreams. The serenity is unbelievable, except I want to believe it. Bluest waves with silver froth. Sun through the palms is damn near orgasmic. And solitude! If I can’t finish the book here, it’ll be my own fault. ***Sort of knew I shouldn’t bring the shortwave. That’ll teach me to donate to NPR. Just can’t resist a “thank you gift.” Will crank it tomorrow. ***Wish I hadn’t turned on the radio. BBC World Service all there is. Downbeat. Swim, then write. Plenty of sunblock. As for writer’s block, perish the thought. ***Latest newscast unnerving. Need to concentrate. I blow this deadline, I’m seriously screwed. OK, no distractions, beautiful isle all to myself. A thousand words a day and I’ll be in clover. ***Radio getting scary. What’s coming out of Washington and Moscow, not to be believed. Stop worrying and get to work! ***Worse. Can’t listen any more. Can’t not. Wish I could call home. ***BBC now mostly static. What I could make out this morning left me shaky. “Standoff” … “ultimatum” … “hair trigger” … “nuclear alert” … “drills.” Threats escalating. Is that idiot trying to prove he’s not Putin’s bro after all? ***Radio gone silent. Can’t write. Should have packed some valium. ***Trump traumatized us. Despicable lunatic president. Groundhog day after day, one alarm after another, real-life nightmare. Early on, so much scorn when Trump said would be better to get along with Russia. Now I wish. ***When I was a kid, most liberals wanted détente with Russia. After Trump got in, a very different approach. (Putin more odious than Brezhnev?) Righteous flamethrowers over nuclear powder keg. Still nothing on shortwave. Cold sweat in this heat. Staring at waves and worrying. Just realized: All the talk about climate change and hardly a word about the ultimate climate disaster—nuclear winter—in which case, forget about agriculture. Or human life on earth. All it would take is a nuclear war with Russia. For all I know, about to happen! When we kept baiting Trump as a Putin tool, maybe we were even crazier than Trump. ***Somehow a zeitgeist switch got pulled. By early ’17, the “Russiagate” juice was pulsing like Times Square. Hypnotic. Didn’t think much about where the frenzy might plausibly lead. I certainly made no objection. Who wants to be a bull’s-eye, Kremlin’s useful idiot? Now I feel like an idiot all right. For never really asking: Where’s all this headed? Just keep increasing the chances of blowing up the whole friggin’ world? ***Oscillating between numbed, frightened, outright terrified. Should have been so obvious, where all the hostile rhetoric was taking us. Should have slammed on the brakes. But so much easier to fixate on Putin, the creepy bad guy with bare chest on a horse. Forget about the nuclear horseman of the apocalypse. ***Supply boat 72 hours late. Still nothing above the water line but sky and birds. All I can do is useless. Starting to dream about arrival of food, water. Crank the radio and think about that last news report. The surreal staccato words, on the edge, out of control. 1. The frenzy of hostility toward Russia made negotiations less and less likely. 2. Absence of negotiations with Russia made nuclear war more likely. 3. 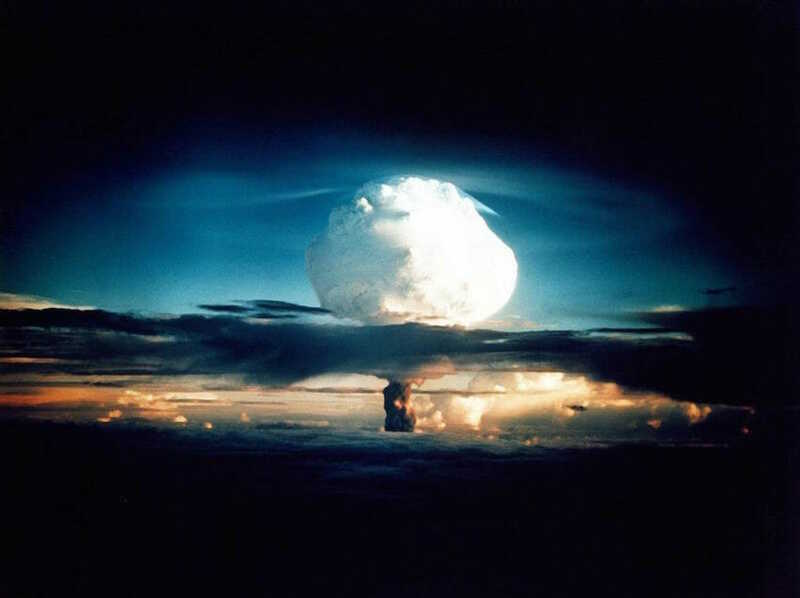 The frenzy of hostility toward Russia increased the chances of nuclear war. The lemming logic of it all was unseen in plain sight, evaded most pivotally by Democrats, liberals, progressives. We were so good at displacing our fearful rage at Trump, we propelled our own stampede. A kind of collective madness, the commonest of common sense. ***Brooding. Climbing walls that aren’t here. How could this be? All of us tiny, but every twig we threw on the fire helped it spread, burn fiercer. A socialized, psychological firestorm. Relentlessly obscuring the biggest picture imaginable. Actually unimaginable. Hardly enticing to wrap minds around nuclear holocaust, or the nuclear winter that would come right behind it. Maybe none of us really could. Instead, steadily, we got our froggy legs boiled in the propaganda pot. And we never jumped out. Now all that Russiagate uproar looks so trivial. ***Always wanted to assume that some people I love will live after me. ***Hungry. Waves lapping. No boat or plane in sight. No radio sound beyond static no matter how hard I crank. Trying to understand how it could have maybe come to this. ***Better reduce my meal portions again. Cut back on water. ***Remembering back to 2017 when Democrats in Congress were quite sanely denouncing Trump for refusing to pursue real diplomacy with North Korea—and many of the same ones were denouncing him for talking with Putin. So party-line clever. Now I’m terrified the world is on fire. ***Still nothing. No drop-off. Eleven days late and counting. Never thought I might die alone under palms. ***Not feeling good. Maybe it’s from cutting back on food. Nauseous, dry heaves. Starting to throw up. ***Will I see the kids again? Do they have any future? Trying not to let fear overwhelm! ***I must have seen hundreds, maybe thousands of cable news hours about how bad Russia is. Doubt even 1 percent—make that 0.1—mentioned the nuclear missiles between us. Minor detail. Careers being boosted, great ratings. ***Water everywhere I can see. Almost out of water. So thirsty. ***I blame the whole spectrum. It wasn’t just the right-wing fanatics and crackpot “centrists.” Just as bad were the liberals, progressives. They glommed onto the madness about Russia. Set aside realities for human survival, an analytical sense of what was at stake. The bennies of conformity and received wisdom were just too great, the need for context, history actually, too large. So they fell for or into one of the oldest basic tricks in the books: diverting attention from the homegrown rot, the obstacles to democracy that couldn’t be closer to home. Instead, they wrapped themselves around the lightning-rod flagpole of rage at who they were told was our foreign foe. And Russiagate was to stand alone as a supreme offense. While supposedly rejecting “American exceptionalism,” those liberals/progressives were fervently embracing it. A silent message in it all, a message so implicit and apocalyptic that it dared not speak its true content, an insane content: It would be worth escalating, and escalating, and escalating against Russia, with no end in sight—or really sought, given the political investment in demonizing Putin as Trump’s patron—escalating the real dangers of horrific conflagration from the world’s two nuclear superpowers. Where would it end? We didn’t ask. Much of the madness was bound up in not thinking about such questions, not asking them, much less searching openly for answers grounded in the real world. There was a word that could scarcely ever be heard, and yet it described as maybe no other could what became more and more likely as a consequence of the hyped Russiagate madness. Omnicide. ***Still no food drop. Prepaid!! Supposed to be absolutely reliable!!! Hope hope hope I’m somaticizing. Don’t know what the nosebleed is about. Exhausted. Aching like some kind of bad flu. ***Sicker. Hardly can move. Need help soon. My God want to see my kids tell I love them!!! !